Through the story of a $6,000 egg, Deb and Todd Duncan reveal that even the smallest interactions have the power to create lifelong patrons, or on the flipside, alienate once-devoted customers. 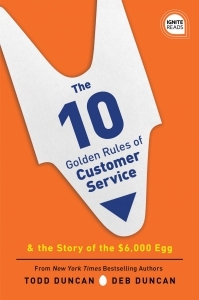 The 10 Golden Rules of Customer Service represents the costly mistake of removing customer satisfaction from the bottom line. The teachable moments divulged throughout the book transcend industry, position, and career level and encourage everyone to contribute, coaching readers to go above and beyond in order to get ahead. The customer service playbook that will help blitz the competition and win life-long customers.